The ball is in the US Senate’s court following an increasingly vocal debate over reform of shareholder proxy systems. Introduced by Republican Sean Duffy and New York Democrat Gregory Meeks, the Corporate Governance Reform and Transparency Act of 2017 (H.R. 4015) – which passed in the US House of Representatives at the end of 2017 – is designed to ‘improve the quality of proxy advisory firms for the protection of investors and the US economy, and in the public interest, by fostering accountability, transparency, responsiveness, and competition in the proxy advisory firm industry’. Under the bill, proxy firms would have to register with the Securities and Exchange Commission, disclose potential conflicts of interest and codes of ethics and make public their methodologies for formulating proxy recommendations and analyses. But while proponents of the bill say it addresses conflict of interest concerns and provide investors with more information to make decisions, opponents – such as Gary Retelny, president and CEO of ISS – say the legislation would deprive the institutional investors who represent them of the unbiased information that helps them make informed decisions. Over in Latin America, there are proposals to change the system by which independent directors are appointed and removed in Latin American companies with the purpose of securing more funding. Aurelio Gurrea-Martínez, a fellow in Corporate Governance and Capital Market, and Oliver J. Orton, Program Manager of Corporate Governance for Latin America at the IFC, write in a paper that the primary corporate governance issue in Latin American companies is not the traditional misalignment of incentives between managers and shareholders but the risk of expropriation of minority shareholders by the company´s insiders (mainly managers and controlling shareholders). They argue that this may discourage outside investors to invest in the region. 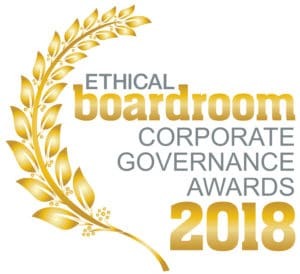 Ethical Boardroom is proud to announce the winners of “Best Corporate Governance” in their respective industry sectors across the Americas for 2018. The awards recognise the outstanding leadership from boards who have raised the bar to ensure that strong corporate governance plays an essential part in protecting and enhancing long-term value for all stakeholders. Our awards program is a vital part of our continuing mission to elevate corporate governance standards globally. Best Corporate Governance Telecommunications BCE Inc.
Best Corporate Governance Conglomerate Honeywell International Inc.
Best Corporate Governance Financial Services Visa Inc.
Best Corporate Governance Oil & Gas Suncor Energy Inc.
Best Corporate Governance Airlines Gol Linhas Aéreas Inteligentes S.A.
Best Corporate Governance Oil & Gas Ecopetrol S.A.
Best Corporate Governance Mining Compañia de Minas Buenaventura S.A.A. Best Corporate Governance Industrial Services Ferreycorp S.A.A. Please note that the winners for the Asia & Australasia region will be announced in the Autumn 2018 edition.